Fueled by faith and determination, volunteers worked tens of thousands of hours over the last several years to rebuild the heart of one mountain village in northern New Mexico. 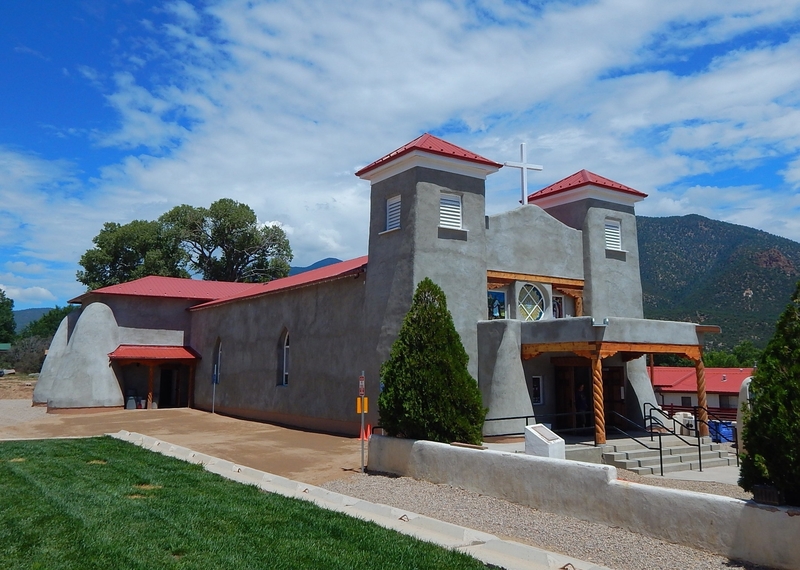 On Sunday, they will gather in Questa to celebrate their efforts with the rededication of the historic San Antonio Catholic Church. Archbishop John C. Wester and other officials will lead a special Mass. One of the church's main adobe walls collapsed almost a decade ago, prompting the Archdiocese of Santa Fe to call for the building to be torn down. Community members wouldn't have it and fought for permission to rebuild the church on their own. "To just let it go and say goodbye was not a real option for us," said Malaquias Rael, a former mayor of Questa and a spokesman for the restoration committee. "For us, it has always been the heart of the community. It's the cornerstone of our community." Rael predicted there won't be a dry eye in Questa during the weekend celebration. As part of agreement with the archdiocese, the villagers had a deadline of six years to rebuild the massive adobe structure and they had virtually no money to do it. Undeterred, they held bake sales, car washes, dances, silent auctions and raffled off trucks, a motorcycle and a quilt. They also sold some of the old adobe bricks from the church to raise money. Rael jokingly called it the "nickel and dime" approach. But over the years, they raised more than $600,000 in donations and received close to a half-million dollars in donated equipment and materials to make the project happen. Another 41,000 hours in volunteer labor went into laying 29,000 adobes, stabilizing existing walls, plastering and painting and creating numerous stained glass windows and the special carvings that border the altar and choir loft. Project manager Mark Sideris said working with an all-volunteer crew was a blessing because their hearts were in it. "What kept us from feeling like we were being overworked is that everybody's forefathers had to make and lay about 50,000 adobes to build this place 170 years ago without any of the resources we have—no mechanized equipment, no mortar mixers, no loaders. It was all by hand and in all seasons and all by daylight," he said. "That kept us kind of in our place." The volunteers were focused Thursday on finishing touches ahead of the weekend celebration. That included installing retablos, or devotional paintings, in the altar screen. The day before, the crew lined up all the pews. It's been a long road and the community has shared its progress through social media . As much of the original church was salvaged as possible, Sideris said. The historic adobes and large vigas from the original building provided a glimpse into what life might have been like in Questa in the mid-1800s. The original builders had to chisel square holes in the timber to haul them down from the mountains as there were no hand augers. They also used whatever was around—corn cobs, left-over meat bones from their lunch and pottery shards—to shim the adobes as they were laid. The adobes—which came in all sizes back then—were placed on bare ground and stretched about 20 feet high to form the main walls. Some walls were 4 feet thick. "The first miracle here was that it stood for 170 years without any foundation and now the second miracle is getting it rebuilt and keeping the roof in place while we did it and keeping many of the walls standing while we did it," Sideris said. "So there are a couple of miracles here for sure." Rael and Sideris said the community is ready to move back into the church, which had been the center of so many family events, from baptisms and first communions to weddings and funerals. "There were all of these stories and just the thought that now that can start all over again, it's going to be back in business and all those new memories can be made," Sideris said. For Rael, who grew up next door, the reconstruction also symbolizes a rebirth for the community. Questa has struggled to find new economic footing in the wake of the 2014 closure of a nearby mine that employed generations of residents. "We wanted to draw attention to what this community is made of," he said. "The mine shutdown made it challenging, but this is an attraction now. We want people to come and see this old building that was restored and learn the story of the people who live here."